If you've come this far, odds are that you either have some new electronic toys in hand or are seriously considering the purchase of some. That means that it's about time to start hooking everything up. This stage is often particularly challenging for people who are new to home theater, so I've endeavored to provide some handy reference material here. Originally, I tried to show complete systems of varying complexity. I've changed that approach and have instead developed a series of diagrams addressing the hook-up of specific components. 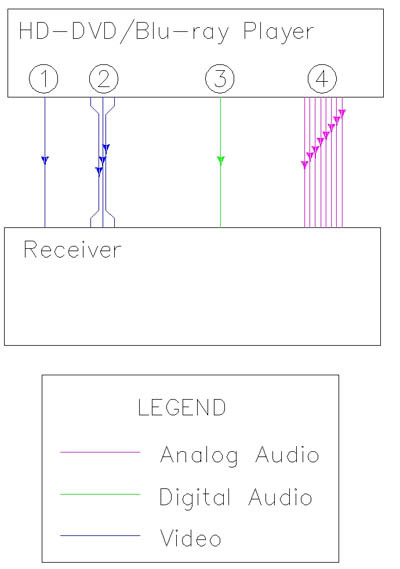 All of the diagrams have legends identifying the different types of cables being used: analog audio interconnects (each interconnect shown is a single "channel," so a stereo connection appears as two lines), digital audio interconnects (either coaxial or optical; I do not differentiate), video (a single line identifies a composite, S-video, or DVI/HDMI cable, and three lines in a group identify a component video connection), speaker cables, and coaxial "cable tv" cables. We're going to start out with a few simple diagrams of basic setups. 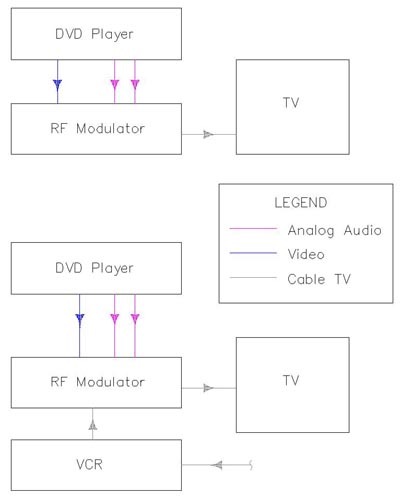 The first diagram is the simplest, showing a DVD player attached to a TV that does not have any audio/video inputs (which people with older TV's will often encounter); in this case, the TV provides the speakers (or speaker, as it will mostly likely not have stereo sound). 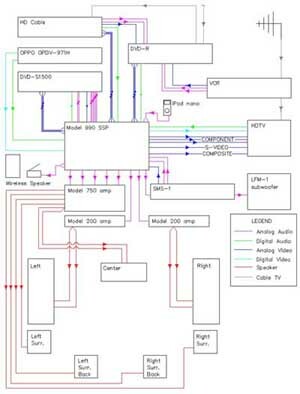 This diagram includes an alternate diagram adding a VCR and switchbox. 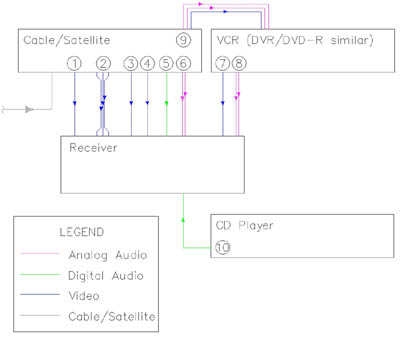 The second diagram shows a system without a receiver that has several devices (DVD player and VCR) connected to a TV and to a stereo system. If you are unsure about what any of these cables and connections and things look like, take a look at the Visual Aid in the Cables section. DVD Player, TV with no A/V inputs, and RF modulator. 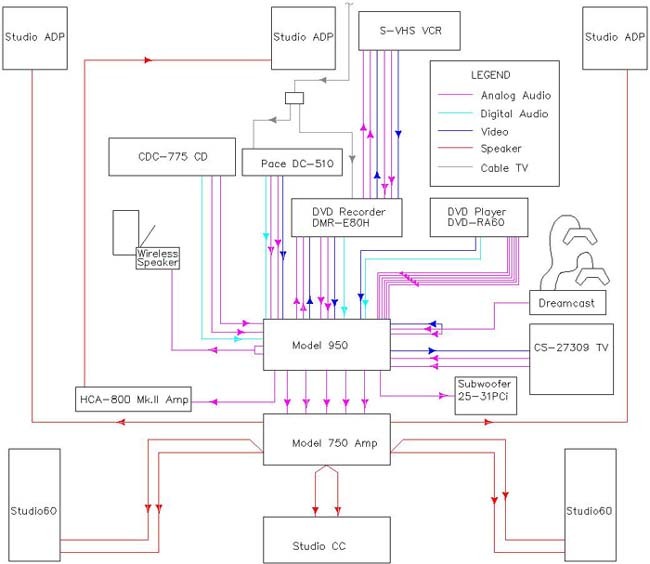 Alternate diagram below adds a VCR. The DVD and VCR signals are kept separate because passing the DVD player's signal through the VCR will cause the Macrovision copy protection to kick in, ruining the picture. This is what you want if all you are doing is hooking a DVD player up with an older TV set, especially if you are retaining a VCR in the setup. Click on the image below for details. DVD Player, VCR, TV with on A/V inputs, an A/V switch, an RF modulator, and the option for a basic stereo system. 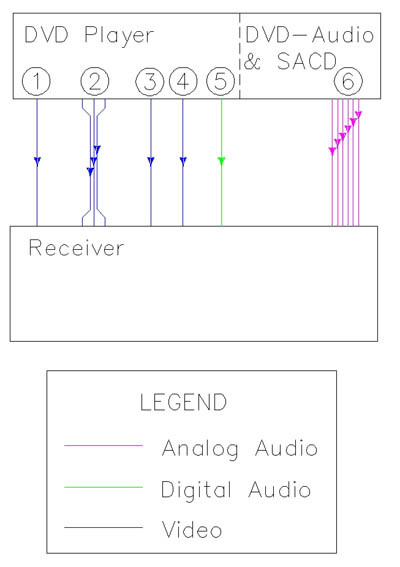 The switch box will let as many as four sources be connected to a TV with only an RF "antenna" input. Click on the image below for details. At this point, we are going to move on to a full-blown home theater setup, complete with surround speakers and a receiver. 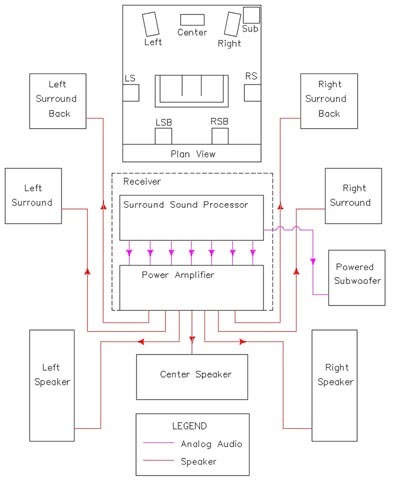 First we have the speakers themselves  typical room placement and how the speakers are all connected back to the receiver. This assumes a powered subwoofer and a receiver with a subwoofer/LFE output  if these two assumptions aren't true, you may want to look back at the speakers section for some pointers. After we get the speakers all hooked up, we'll start looking at sources. Your receiver is also going to be outputting video data to your TV in most cases. 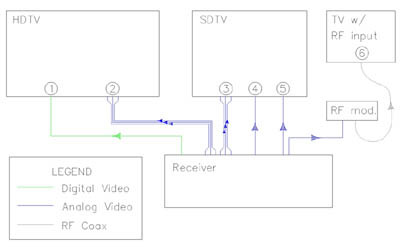 This means connecting the monitor video output(s) of the receiver to the input(s) on the TV. 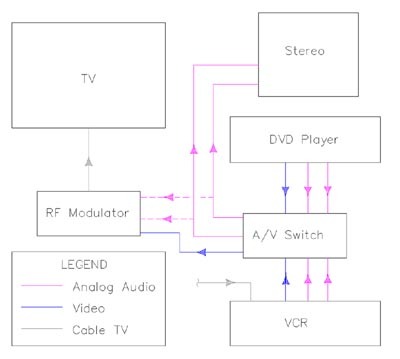 With that in mind, we'll take a look at the various ways that a TV might be connected to a receiver. Any home theater these days will have a DVD player in it. That player may also support DVD-Audio and/or SACD discs and may offer progressive scan or upscaled video output. Getting the player connected properly is a crucial step. The HD format war has introduced us to two very similar new players  HD-DVD and Blu-ray. Since they are new technology (not to mention well-stocked with encrpytion and other copy protection rigamorale), it's probably worthwhile to explain how to hook them up. The old TV "rabbit ears" have been widely replaced by cable and satellite services. Those services will both require you to connect another box to your receiver. While we're at it, we'll toss in a couple different schemes for putting an old VCR in the mix. The diagrams above should cover the majority of cases, and most of the ones that aren't addressed (media player, game console) can be related to the examples above very easily. If I get requests for other diagrams that seem appropriate for the site, I'll add them. To wrap things up, though, I'll end with a diagrams of my system as of August 2003 and April 2006.